Activists and politicians assembled Friday afternoon at Premier Pauline Marois’ doorstep on the corners of McGill College and Sherbrooke Street to show their anger and disappointment at what they consider the rising state-sanctioned exclusion against Quebec’s religious, linguistic, and ethnic minorities. Conceived by Canadians for Coexistence (CfC), a group advocating for full Canadian inclusion, only a handful of the planned 200-some individuals came out to brave the wind and the rain. Although the weather might have chilled bodies it certainly failed to dampen the fiery rhetoric. “We’re a group that believes in diversity in inclusion and the PQ is against our beliefs. They’re a group that very clearly believes in exclusion and division,” said founding member Norma O’Donnell, highlighting in particular the rights of Quebec’s religious and anglophone minorities. When asked on her thoughts as to why anglophone rights aren’t more visible, she said there were many reasons; from sympathetic francophones who remain quiet because of social pressures, to an inability to connect with students. 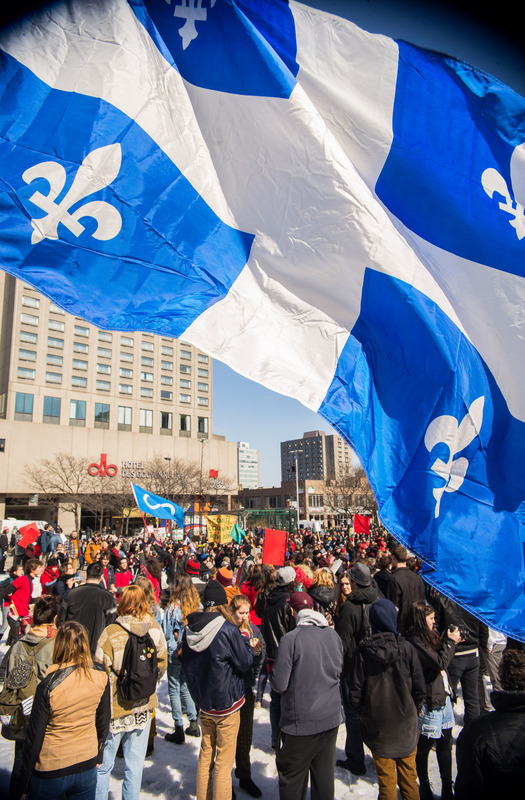 “It’s seems like students in Quebec are more concerned about their tuition than their rights and freedoms, which is extremely disappointing,” she said about the number of youth protesters, and referring to the recent Charter of Values which would prohibit ostentatious religious displays and clothing by government employees, and last year’s failed Bill 14, which would have strengthened the primacy of the French language. Though interviewed well before Monday’s elections, O’Donnell said that one way or another, whoever wins, her group’s ambitions were only just beginning. Echoing O’Donnell’s sentiments was Montreal’s Reverend Darryl Gray, former Kansas state senator and head of English rights group, Alliance Quebec, and current pastor of the Imani Family and Full Gospel Church. Gray, who says he has supported civil rights movements for decades, was careful to draw distinctions and not paint everyone with the same brush. Additional speakers included, amongst others, Green Party leader Alex Tyrell and Muslim community activist, Salman Shabad Saidi, who organized Montreal’s first World Hijab Day back in February and has been, like Tyrell, a very vocal critic of the Charter. Saidi calls the PQ tactics cheap attempts at raising division for political reasons, and mocked Marois’ vision of Quebec. “We have our own ideas that are based on tolerance, intelligence, diversity, and productivity,” Saidi said, adding that his strong words were necessary to reflect the very real undercurrents in Quebec which are only now beginning to be voiced.